Yesterday I posted about the idea of developing a "mise en place" system for the things that you do, and I also mentioned that this is something we can do with any number of tasks and goals. One of the things that I have always wanted to do, admired, but never seemed to get any closer to doing, was Native American beadwork. This, I know will probably come across as a strange subject, but it's something I've admired and wanted to learn about and practice for years. Like so many other things, though, the barrier to entry and to regular practice is real. Below is a picture of what, on the surface, may look like a simple project. As far as bead working goes, this is relatively simple. This is also my "mise en place" for when I do this type of beadwork. It's a "roach stick" or a "roach pin". For those who dance in Native American Pow Wows, the common head-dress is the "porcupine guard hair roach". These headdresses are held on by a lock of braided hair or through a base material that can be tied to the wearers head (me being bald, I opt for the latter). The roach pin is what is used to hold the headdress in place, either passing through the braid, or acting as an anchor for the shoestring used for tying. These pins are often beaded with rich colors and patterns. The style of beading that this is is called "three drop gourd stitch". Unlike applique, loom or lane stitch techniques that allow you to string lots of beads together and put them down at one time, gourd stitch is done one bead at a time. This is because the beads are literally woven into a spiral net, and each pass of the thread goes through an adjacent bead to make the pattern. Because of this, you have to plan your design both stylistically and mathematically. To have a design that truly repeats around the piece, you need to make sure that your piece can have beads that wrap around it in a multiple of three, and even better, also in multiples of six. This allows pattern design to match up. I use what is called "bead graphing", where I take a piece of paper, the bead spirals arranged in the pattern I wish to use (typically that means a clockwise pattern with the beads stacking in a right to left diagonal going up). On these papers, I make a design, and then I count the "circuits" needed to make the design, meaning the number of times around the object in a given row. 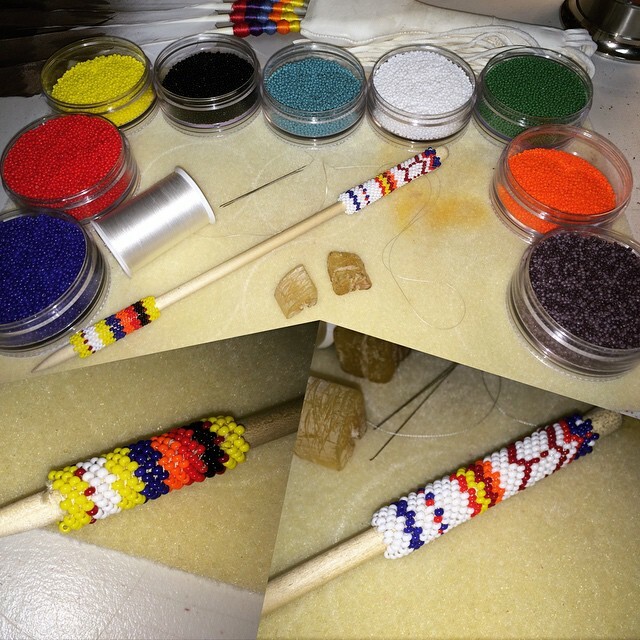 As an example, this roach stick needs 24 beads to make a straight line around the project. Divided by three, that means I have eight beads in any given circuit. Divided by six, that means I have four regions I can create a repeating design. With these values, I can chart and decide what I want to make. I'm working with seed beads, which in this case are 11/0 cuts. 11/0 is the size of the beads. Eleven strung beads will cover one inch. For every square inch, there will be 110 beads. 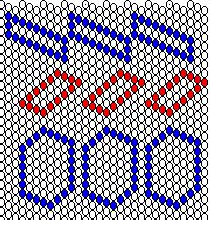 Multiply by the total area of a project, even for small projects, that's a lot of beads. These beads can go as small as 18/0 (eighteen in series an inch long, or 324 beads per square inch. The other tools needed for this are very thin but strong thread, thin needles, and clumps of beeswax to wax the thread (which helps it slip through the glass beads and not fray or, worse, break). On a good day, if I'm in the groove, it takes me about an hour to do a single inch of beading. On days when things don't quite work out right, it may take me a lot longer to cover the same inch. Additionally, the pattern ideas and designs I work with now are fairly rudimentary. I stick to bands of color, zig-zags, or hexagons, but I would like to expand to do more unique shapes like feathers, flags, flowers and birds. The challenge, of course, is that I won't actually know how to do them until I sit down and painstakingly, bed by bead, actually construct them. This is where many aspiring bead-workers falter, get frustrated, and stop altogether. I know, I've reached this point several times over the years. This pictured roach pin is the current largest piece I've ever made. I've planned to make four of them, each different, each using motifs that I want to get better at. If you look just behind my beading palette, you will see a flat fan with a white handle. After I finish the roach sticks, that will be my next project. I already know it will be huge. It may take me 40 hours plus to do it. What's been helpful is that I've gotten used to using the tools and thinking about the process, and actually losing myself in the process, and discovering ways that it can be done more quickly, more efficiently and more effectively. I also allow myself the ability to let my mind dictate what I can and will do in a given day. Right now, it's a simple goal, one hour each day. Some days, I put in a lot more. Some days, I literally just practice a pattern and then cut the threads loose to try another approach. As I've talked to other bead workers, they've all commiserated with me and said that they have been there and understand. We tend to be in awe of those who can do these things effortlessly, who seem to be so much better than we are. In truth, they are better than we are, but not because they have unerring instincts or some super natural talent. Instead, it's because they have built a skill, honed over perhaps hundreds or thousands of hours of practice, often to meet needs they have, and frequently with false starts, frustrations, and cutting the whole thing apart to start again. This is decidedly different than most of my posts, but the parallels to software testing are abundant. We can talk a mean game about the techniques and tools we use, and the ways in which we use them, but to become truly good at them, we need to put the time in, hone our craft, practice, get frustrated, throw in the towel and walk away, and then come back and start it all again. Can it be tedious? Sure. Is it always fun. Not remotely! Will we get better if we persist? Very likely. Will we wow people right out of the gate? Again, most likely not, but that's beside the point. The best we can do is to work and practice and make things that help us. As we get better at that, others will possibly notice our work, too, and over time, consider us the experts. In their minds, we may well be, but we'll know the truth, won't we ;)?